Diamond Essence helps you sparkle and shine without spending a fortune, featuring the best simulated diamonds ever created, since 1978. 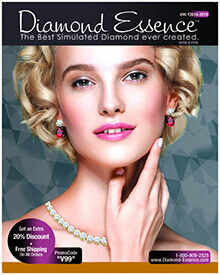 Please enter the Coupon code - catalogs - at checkout on the Diamond Essence website. Rings - Diamond Essence makes it possible to bling yourself while staying on budget with a luminous selection of simulated diamond jewelry pieces that are set in 14K solid gold, white gold, sterling silver and vermeil settings. Whether you're tying the knot, celebrating an Anniversary or making a promise for the future, Diamond Essence rings will add the perfect bit of bling to any occasion. Discover an exquisite selection of virtually flawless simulated diamond rings that are always the equivalent to a classification D and perfectly cut to exacting standards. Choose your preferred carat size and stone shape from an extensive selection of simulated solitaire rings, engagement rings, wedding sets, designer rings and eternity bands. Pendants & Necklaces - Pay less per carat with a colorful assortment of simulated diamond pendants that pair beautifully with delicate gold and sterling silver chains. You'll find clusters of colorless diamonds as well as colorless solitaire stones and crosses, stunning sapphires, canary yellow, pink, emerald, lavender, champagne hued, ruby red gemstone pendants, and even more of the best simulated diamonds and necklace combinations to choose from. Don't forget to use your Diamond Essence coupon code for exclusive savings on every order. Earrings & Bracelets - From breathtaking studs to stylish hoops and drop earrings, Diamond Essence will ice her ears with a piercing collection of simulated diamond earrings that will make a million dollar statement for an understated price. Spoil your beloved even more by treating her to a companion piece, with a dazzling collection of ladies tennis bracelets that will serve as a perfectly matched set. Stones - From marquise shape diamonds to trilliant and cushion cuts, Diamond Essence rings to pendants, you'll find everything you need to build your own unique jewelry, starting with the perfect stone. Find a radiant variety of loose diamonds that can be mounted on rings, transformed into brilliant studs, or dangled from an elegant chain to create a truly one of a kind piece. Choose your favorite cut and size from an effervescent collection of loose simulated stones, including heart shaped and emerald cut stones, round brilliant, oval, pear shaped and princess cuts that are ready to be paired with the perfect setting. Diamond Essence is your source for stunning simulated diamond jewelry. Discover simulated stones that are a fraction of the price of mined diamonds, set in precious metals and guaranteed for life for their sparkle, cut, brilliance and clarity. Browse by metal, price, occasion, stone color or birthstone to find your next dazzling treasure.